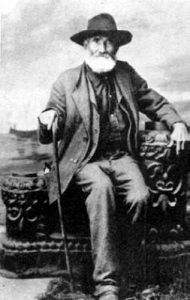 James Henry Lane, aka: “The Grim Chieftain,” Bloody Jim (1814-1866) – Principal leader of anti-slavery forces in Kansas during the Kansas-Missouri Border War and the Civil War. Lane’s Brigade, aka: Kansas Brigade (1861) – Described as little more than a mob of thieves and adventurers, these troops went on a looting and burning rampage in western Missouri in the summer and fall of 1861, in the end entirely destroying the city of Osceola, Missouri. William Henry Lewis (1829-1878) – Army officer who participated in both the Civil War and the Indian Wars. He was killed in the Battle of Punished Woman Fork, the last Indian battle in Kansas. James Longstreet (1821–1904) – Known as Old Pete and Lee’s War Horse, Confederate General Longstreet became one of the Civil War’s most controversial figures. Hard hitting in the attack, he nevertheless sensed the power of the tactical defense in an age of rifled weapons and field fortifications and preferred to fight from the defensive. His performance at Gettysburg, Pennsylvania drew fire from postwar critics who believed that, when General Robert E. Lee rejected his repeated advice to outflank the strong Federal position, Longstreet sulked and thereby cost the South the battle. Yet Lee never uttered direct criticism of Longstreet, who stood by him to the end at Appomattox, Virginia. He was one of the most valued and trusted lieutenants to General Lee. Isaiah Mays (1858-1925) – Buffalo Soldier who fought bandits in the Wham Paymaster Robbery and awarded the Medal of Honor. 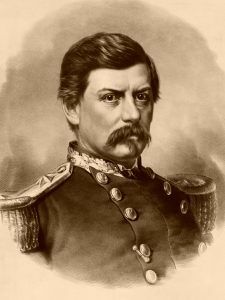 George Brinton McClellan (1826-1885) – Serving in the Mexican-American War, McClellan became a Major General during the Civil War, in which he organized the famous Army of the Potomac and served briefly as the general-in-chief of the Buffalo Soldier Army. Nelson Appleton Miles (1839-1925) – A career soldier, Miles served in the Civil War, Indian Wars, and the Spanish-American War. 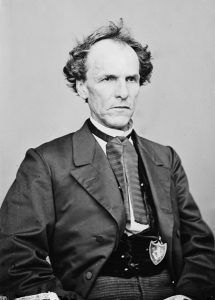 Colonel James Montgomery (1814-1871) – A Free-state leader during the Kansas-Missouri Border War, and a Colonel in the Union Army during the Civil War. Brigadier General John Hunt Morgan – One of the Confederacy’s most notorious raiders, Morgan was captured in 1863, after raiding north across the Ohio River. Escaping, he returned to Southern service and was killed in September 1864, at Greeneville, Tennessee. Colonel John Singleton Mosby – A noted Confederate cavalryman and partisan ranger during the American Civil War. Enlisting in the Confederate army, Mosby was quickly noted as a skilled leader and swiftly rose through the ranks. Given command of a partisan ranger unit, John Singlton Mosby became renowned for daring lightning attacks on Union. Frank Joshua North (1840-1885) – Best known for his organization of a group of Pawnee scouts, North was instrumental in the Indian Wars, protecting the wagon trails and later, the railroad crews during the construction of the transcontinental railroad. 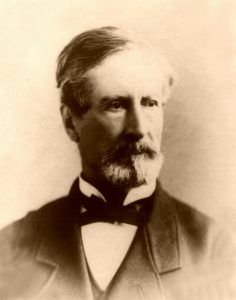 John Clifford Pemberton (1814-1881) – John Clifford Pemberton was a career U.S. Army officer, a veteran of the Mexican-American, Seminole and Mormon Wars, and a Confederate General. Major General George Pickett – Commander in the Army of Northern Virginia, he is best remembered for Pickett’s Charge during the Battle of Gettysburg in July 1863. In the war’s final days, Pickett was defeated at the Battle of Five Forks. Zebulon Montgomery Pike (1779-1813) – A soldier and explorer for whom Pikes Peak in Colorado is named, Pike mapped much of the southern portion of the Louisiana Purchase. Salem Poor (1747–1802) – An African-American slave who purchased his freedom, became a soldier, and rose to fame as a war hero during the American Revolution. Pottawatomie Rifles (1855) – A group of about one hundred abolitionist (or free state) Kansas settlers of Franklin and Anderson counties, both of which are along the Pottawatomie Creek. The band was formed in the fall of 1855, during the Kansas-Missouri Border War, as an armed militia to counter growing pro-slavery presence (an influx of men known as Border Ruffians) in the area and along the Missouri border. Led by John Brown’s son, John Brown, Jr., men from the Pottawatomie Rifles took part in much of the violence known as Bleeding Kansas, including the Battle of Osawatomie and the Pottawatomie Massacre. Although John Brown, who was famous for his own raids and his involvement with Harriet Tubman in the attack on Harpers Ferry, frequently accompanied his son, he was not officially a member of the group. Sterling Price, aka: “Old Pap” (1809-1867) – A lawyer, politician, and general from Missouri, he fought in the Mexican-American War and for the Confederate Army during the Civil War. 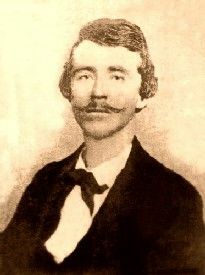 William C. Quantrill (1837-1865) – A guerilla fighter for the Confederate Forces, active in Kansas-Missouri border war. Marcus A. Reno – (1834-1889) – A career military officer in the Civil War and the Black Hills War against the Lakota Sioux and Northern Cheyenne, Reno is most noted for his role in the Battle of the Little Bighorn. William S. “Old Rosy” Rosecrans (1819-1898) – An inventor, business executive, diplomat, politician, and United States Army officer. He gained fame for his role as a Union general during the Civil War after several prominent battles in the Western Theater. However, his military career was effectively ended following his disastrous defeat at the Battle of Chickamauga in 1863. William Tecumseh Sherman (1820-1891) – A career military man, Sherman served in the Civil War before becoming an Indian Fighter. Philip Henry Sheridan (1831-1888) – A career military officer, Sheridan served in the Civil War becoming a Union General. In 1865, his cavalry pursued General Robert E. Lee and was instrumental in forcing his surrender at Appomattox. Later, he became involved in the Indian Wars, tarnishing his reputation with some historians, who have accused him of racism. James Ewell Brown “J.E.B.” Stuart (1833-1864) – Better known as “Jeb”, Brown was a soldier from Virginia who served as a Confederate general during the Civil War. He was killed on May 12, 1864, during the Overland Campaign, at the Battle of Yellow Tavern. Creed Taylor (1820-1906) – A career soldier and Texas Ranger, Taylor fought in the Texas Revolution, the Mexican-American War and against Indians during his time as a Ranger. Alfred Howe Terry (1827-1890) – Terry was a Union general in the Civil War and the military commander of the Dakota Territory from 1866 to 1869 and again from 1872 to 1886. William B. Travis (1809-1836) – A lawyer who settled in Texas from Alabama, Travis strongly disliked Mexican rule, and fought in the Texas Revolution. Fighting along with James Bowie and Davy Crockett, he was killed at the Battle of the Alamo. Earl Van Dorn (1820-1863) – A West Point graduate and career U.S. Army officer, Earl Van Dorn fought with distinction in the Mexican-American War, but, resigned his commission in 1861 to join with his native state of Mississippi, in the Confederate cause. He would make the ultimate sacrifice for his beliefs. 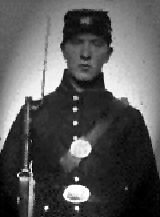 Sarah Rosetta Wakeman; aka: Private Lyons Wakeman (1843-1864) – Disguising herself as a man, Wakeman fought in the Civil War for the Union. Stand Watie (1806-1871) – Also known as Standhope Oowatie, Degataga “Stand Firm” and Isaac S. Watie, he was a leader of the Cherokee Nation and a brigadier general of the Confederate States Army during the Civil War. Major General Joseph Wheeler – Serving in the Western Theater of the Civil War, Joseph Wheeler took part in most of the major actions in that region. Returning to the US Army after the war, Joseph Wheeler later was a key commander during the Spanish-American War. Cathay Williams (1842-??) – When Congress passed an act authorizing the establishment of the first all-Black units of the military, later to become known as “Buffalo Soldiers,” Cathay Williams, became the first and only female Buffalo Soldier. By Kathy Weiser-Alexander, updated April 2019.